Sick of delivering the same old material and the lack of progress in your Comedy? Our membership programmes provide you with regular coaching, support and accountability. We know that you’re more likely to succeed when you have clear objectives, check ins and deadlines. If you want to see a real improvement in your Comedy and take it to the next level, membership is for you. You’ll write lots of new material and edit it to its best. You’ll be more analytical with both your comedy writing and performance. What’s working for you? What’s not? How can you stand out in a crowded industry and deliver a set that makes you memorable with the audience and promoters? With expert advice, set tasks and an action plan you’ll be able to monitor your progress and make a wider impact within the comedy industry. Hard work and determination is a prerequisite of all membership programmes. All programmes are for 6 or 12 months and have Payment plans to help spread the costs. The 121 Coaching sessions can be done virtually for members outside Brighton. Monthly Comedy update of everything Comedy, including gig opportunities, workshops, Fringe news. Discounts to Comedy events like the Comedy weekender, day workshops, Public Speaking & Creative writing courses. It was great to get back into the swing of things. Stand-ups one of the hardest things to keep going with on your own. It was great to meet all the other members and to hear and encourage each other again. It’s been well worth the investment and I’m now writing my fist show for the Fringe Festival. Discounts for the masterclasses were super too. The membership’s main benefit has been the accountability. I was given clear and manageable tasks to complete every month. I think that writing has become easier due to the first bit of coaching advice I was given, to find a regular writing routine. Having an expert feedback on my material has been excellent, and my mindset has changed around my comedy aspirations too. I feel more confident and my materials better. Delighted I took the plunge! I felt as if I wasn’t going anywhere with comedy and was sick of reeling out the same stuff. I couldn’t find the time or motivation to write a new set. I knew I’d benefit from writing a whole new ten minutes but never sat down to write it. I probably lacked a bit of confidence too, was worried that it wouldn’t be any good. I tried out material in a few open mike nights which was more comedians than audience and didn’t find that helped much. I think having a mentor who listens and critiques my set and helps me tweak it to its best is invaluable. Thanks Louise, it’s been great. I was near chucking stand-up. I joined the membership in a last-ditch attempt, not necessarily be a TV comedian but so that I could start enjoying comedy again. I felt a bit stale with what I was doing. Louise encouraged me to start experimenting with different genres of comedy and I was surprised to find that I really enjoyed writing and delivering one liners. I didn’t go on Louise’s beginner’s comedy course, though I wish I had. The comedy course I went on had very set ideas on comedy, a one fits all approach, and I didn’t feel that I could develop my individual persona on stage. I have re-found my love of comedy and I’m really enjoying performing again. Comedy Store ahoy! 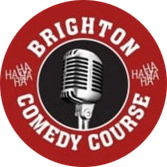 I loved the beginners and advanced courses with Brighton Comedy Course though when I finished them, I found it hard to keep writing material and booking gigs. The longer I left it, the more I was bricking it about performing, even though I knew I loved the buzz! I left it for more than a year, and just kept putting it off. I was so glad when the membership became available. It was great to have regular check ins and to catch up with other comedians at the socials and the monthly workshops. Started putting time and getting excited about it again and wrote and delivered my first new ten minutes in London which went down well.